Current: What is Customer Journey Map? You want to create memorable first impressions and deliver differentiated buying experiences to your customer? You want to find out how your customers shop in today's digital world? What are the most influential channels and touch points in their customer journey and how can you impact these? How does this work for the new product category you wish to enter? Customer Journey Map is a powerful technique for understanding what motivates your customers - what their needs are, their hesitations, and concerns. Although most organizations are reasonably good at gathering data about their customers, data alone fails to communicate the frustrations and experiences the customer experienced. A story can do that, and one of the best storytelling tools in business is the customer journey map. Customer journey map uses storytelling and visuals to illustrate the relationship a customer has with a business over a period of time. The story is being told from the perspective of customer, which provides insight into the total experience of the customer. It helps your team better understand and address customer needs and pain points as they experience your product or service. In other words, mapping out the customer journey offers your business the chance to see how your brand first engages a potential customer, and then moves through the touchpoints of the entire sales process. Bring teams together to resolve specific customer hurdles for understanding core customer journey paths, where additional development will provide biggest impact. Build faster and higher customer conversion rates by minimizing negative customer experiences, through identification of key steps and decision points. Improved customer retention, through understanding how they transit through, say, each stage of a procurement cycle to ensure the correct information is available and accessible to all stakeholders. Allows a business to zoom-in a single customer journey in a specific channel. Understanding of required metrics to identify customer's progress and fall out points, providing opportunities to bring customers back on board. Customer journey is a journey of a potential customer about different points of contact with a product, a brand or (touchpoints) of a company via all available channels until he performs a desired target action. A customer journey can extend over several hours or days. Major target actions are purchases, orders or inquiries. Touchpoints are any kind of contact points between customer and your business, from classical advertising (ads, TV or radio spot, etc.) through online marketing activities through to the opinion of a friend or information on review sites. Available channels such as telephone, web, branch, marketing communications and service interactions. Journey maps can take a wide variety of forms. The end goal, however, is always the same: find and resolve the pain points of your customers. Personas and journey maps are both important strategic tools that help provide an in-depth understanding of who your customers are, what they need, and how they interact with your business across all touch points. But more importantly, for sharing customer insights across the organization. Much of the information for creating a journey map comes from your personas (e.g., their goals, motivations, key tasks they want to accomplish, and current pain points), which is why it's best to create the personas first. The first thing you need to decide is whose journey you are going to map such as, a specific customer type (persona), a potential (target) customer, or a segment of customers, depending on the purpose of your journey mapping initiative. 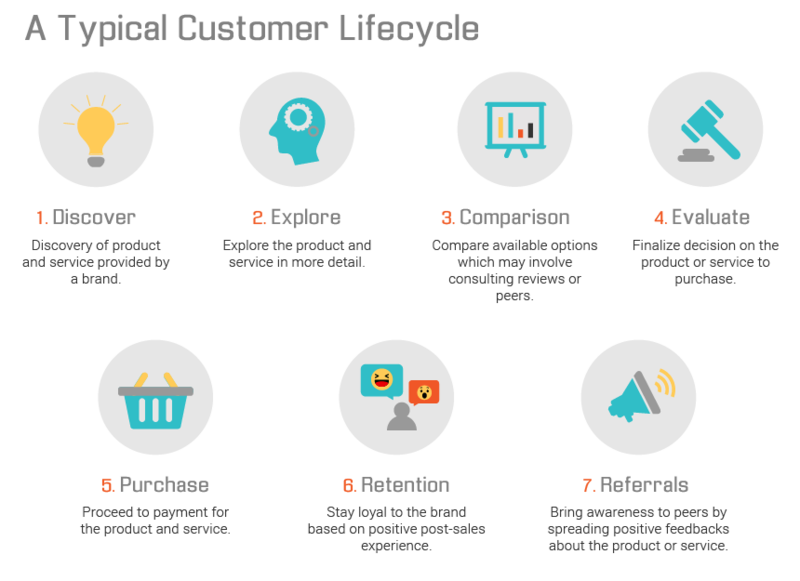 Once you've created distinct personas, you can use them to create customer journey maps that describe each persona's experience at various touch points during their lifecycle with your company. Journey maps are typically organized by customer stages (sometimes referred to as phases). Each stage represents a major goal your customer is trying to achieve in their overall journey. You should build a customer journey map with stages that represent your customer's goal-oriented journey, not your internal process steps. So once you've defined your persona, you have to identify the stages of the customer's journey. What process does it take to start from consideration all the way through buying your product or services? Based on the persona define the stages that your customer experiences with you over time. Define how, when and where they: discover your company, research your products or services, choose you over competitors, purchase from you, and maintain a relationship with you. Customer touchpoints are your brand's points of customer contact, from start to finish. For example, customers may find your business online or in an ad, see ratings and reviews, visit your website, shop at your retail store or contact your customer service. This seems like a long list, but these are just a few of your touchpoints! Identifying your touchpoints is an important step towards creating a customer journey map and making sure your customers are satisfied every step of the way. While you may need to offer some incentives for participation, most people are happy to help if they believe you are genuinely interested in their experience and will use their feedback to improve things for others. Once you have understood your persona's goals and written down their touchpoints, it's time to look at the big picture - the totality of their experience with your company. Every business will look through the lens of their customer personas differently. Walking through each of the journey map stages with your team will help you identify any points of friction within the customer experience. Are customers not aware of this solution that you've already provided? If so, why not? Up until now, I've focused on the frontstage or outside-in view of the journey. The backstage refers to the internal systems, processes, and people that are involved in delivering that journey. This is the inside-out view of the journey. When combined in a single journey map, these two views are often referred to as a Frontstage/Backstage Map or an Eco-System Map. Mapping the frontstage and backstage on one map creates visibility to the internal resources and processes that are responsible for delivering the customer experience-visibility that can help your organization understand what is involved in delivering and ultimately improving the customer experience. How are your customers finding you and how do they solve (or cope with) the problem before using your solution? What is the customer problem you are trying to solve? Or in other words, what are the common problems and pain points customers experience that your product can help alleviate? How easy is it for customers to gain access to customer service for support? How are you trying to improve customer engagement across channels? Is it easy for the customer to pay for your product or service? YouTube video - What is Customer Journey Mapping?